Hooray!!! Another Mary Poppins picture! You never disappoint – this one is awesome. You really captured her well, in your own fun style. Love it. Happy birthday, by the way! Hope you've had a nice day! BTW, I'm totally planning on seeing Mary Poppins at Capitol theater with you. Let me know when tickets go on sale! I love it. Your style is so distinctly your own. Although re-watching it recently, I was so MAD Burt and Mary Poppins never got together! How did I miss that as a child?! How can you not just love Mary Poppins. I hope to be just like her in the next life. @Heather K – YES! I'll keep an eye on the website. @Heather Z – I'm so in love with Bert. It's not even funny. Love the picture, Heather! As far as the relationship between Mary and Bert, I'm glad Disney left it where he did. I had a bit of a Star Wars moment when I read the book and found out Mary Poppins and Bert's real relationship. 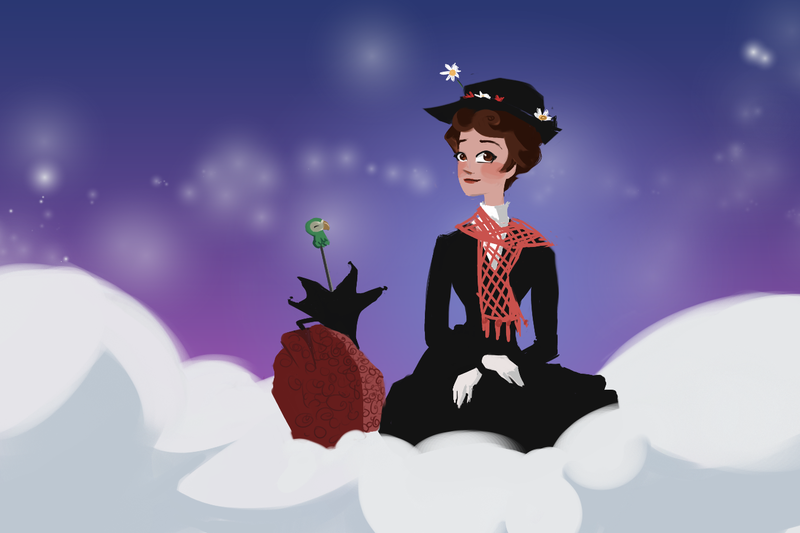 I always get Mary Poppins songs stuck in my head when I visit your blog! But those are much nicer than the Legend of Zelda theme music currently in my head. Thanks for sharing another fun pic! this is the best of your mary poppins series, i think.